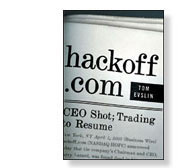 Tom Evslin, like hackoff.com CEO Larry Lazard, founded a company-ITXC- which went public during the Internet bubble. Unlike Larry, Evslin lived to tell the story of those times. Besides being a serial CEO, an inventor with five granted patents, a licensed pilot, a failed candidate for the US Senate, the former Transportation Secretary of the State of Vermont, and a nerd, Evslin is well-known to web cognoscenti who enjoy his war stories about the Internet bubble and the years before and after on Fractals of Change. Get the story your way! Larry takes his company public. Its stock price soars and collapses. Following a hostile takeover attempt, Lazard is found dead in his office.